In some ways my musings upon Guattari’s phrase were nothing other than a re-articulation, during the winter years of the mid ‘90s, of the spirit of the underground culture that had arisen in the ‘60s and, to some degree, petered out as the post-punk moment (that had educated many people into a ‘desire to know’) reached a kind of apogee in pop: ‘selling out’ as an ironic pose. This was, in some ways, concomitant to the rise of cultural studies through which even the infiltrative intents of pop subversion were rendered into abstract signs of cultural kudos rather than into propellants of a cultural combativeness. In these depoliticized years of the ‘90s, then, there was, amidst the wider movement of the rave and techno culture, an opening towards a rearticulation of counter culture and, for me, post-media signaled once more the benefits of an independent approach that could not simply become a vehicle for the usual forms of politicization but, as a shared practice and as a mode of relation, could make ‘labour in culture’ the meeting ground for a re-imagining of a politics based upon the reappropriation of both the means of production and the means of expression. Post-media, then, was taken as post-mass-media both in terms of ‘outflanking’ the media conglomerates and differenting-out the ‘mass’ or the ‘silent majority’ that were the objects of a kind of technical and functional dispositif that the conglomerates passed off as entertainment. Third Cinema, then, shares much with Guattari’s notion of a post-media era. That it came to light many years before Guattari’s writings on the subject is less indicative of Guattari’s lack of originality as it is of the pervasiveness of critiques of the media, and, in the case in hand, what Fernando Solanas and Octavio Getino refer to in their essay as “industrial cinema”. This essay, Toward A Third Cinema, first published in 1969, has, many commentators suggest, been subject to a kind of genre defining stasis as if it was the first and last word on both refusing the terms of the western Monoform and on encouraging others to take up the camera. Perhaps its readers have skimmed over the ‘Toward’ in the essay’s title as well as their being unable to follow up on the Spanish-language re-writes and amendments this essay has had over the years. So, in some senses, Third Cinema has become something of a catch-all phrase at the same time as being, in no small part, an address to their fellow intellectuals, it is something more like an inciteful beginning informed as much by the anti-colonial struggle as it is by aesthetic standards. However, its continuing importance lies, for me, in the way that it sustains a context for debates and investigation into the dominant novelistic conventions of cinema and how it provides a space of encouragement in which others can take the confidence to work on their own terms and embark upon a “process of singularisation”.6 Indeed, Solanas and Getino refer to Third Cinema as “an inhibition removing practice” and this in some ways is brought about by Third Cinema’s insistence that all the conventions of making films (narrative, plot, drama, actors, stage sets, raising funds etc.) can be easily abandoned if the focus of the film is to make a movie as a “living document and naked reality”7 . If we take their film Hour of the Furnace as an example of what they intend by Third Cinema, then, it puts us in mind of a kind of activist cinema, a newsreel from the other side, that prefigures the coming of Indy-Media outlets. From another perspective, this film, with its didactic voiceover, is reminiscent of Debord’s Society of the Spectacle, and yet unlike this latter film, the contrast between what is said and what is seen, a kind of jarring together of perception and affect, still retains a transformatory potential in that, with the visceral struggle against oppression being revealed, Solanas and Getino achieve the marked ‘dissolving of aesthetics’ that they sought. This suspicion of aesthetics, an aesthetics that for Taylor has its roots in Man-defining physiognomic categorization and, one could add, the ethnographic ‘capture of souls’, is taken up as well by Julio Espinosa in his essay, For An Imperfect Cinema. In this manifesto, also from the late 60s, there is a challenge to the role of the ‘artist’ in capitalist society and an assertion that we are “no longer interested in quality or technique” or in “predetermined taste”. Espinosa later complained that this piece of writing of his was misunderstood as implying he was setting out to make ‘bad cinema’, but in this essay he is asserting something akin to the Situationist call for ‘the realisation and suppression of art’ when, in stating that “art will not disappear into nothingness; it will disappear into everything”, he is suggesting that cinema would become ‘imperfect’ because, as could be said of Third Cinema, it set out to meet neither the criteria of (aesthetic) perfection nor the terms of western critical maxims. Whilst singularizing differences are erased by the Monoform through the competing demands of funders, producers, actors, critics and ultimately the market, the Third Cinema classics, arising in a ‘post-mass-media’ vacuum away from the centers of taste-making and over-planned formats, are, like much counter-cultural creativity, more free to develop films that are directly affecting in that they embrace that which eludes consciousness and received wisdom (especially a consciousness that is blind to its own ‘lens flare’ by constantly being caught in the dull glare of Western narrative conventions). We have already heard how Med Hondo immersed himself in the context of his films as a producer-participant and we could reflect, too, on how Djibril Diop Mambéty, in the opening of Badou Boy, has himself with camera in shot amidst a mélange of people who could be actors, camera people, technical assistants, passers-by etc. Everything in this opening sequence seems like ‘life lived’, an unmediated mise-en-acte that, open to the possibility of scriptless alterity, seems to have dispensed with the ‘past definitive tense’ of novelistic fiction whose seeming plenitude, makes us, as viewers, incapable of imagining anything else. Yet, in that mélange, on that line between fiction and documentary, with the image attaining a polysemy irreducible to language, with the action setting off unbridled, something other than the Badou Boy seems to be escaping down the alley. Some commentators seem to imply that these ‘36 varieties’ could be purely “national and local”, as if the ‘36’ were only a harbinger of a multi-cultural cinema, but the consummation between the cultural and the social (social jouissance) is perhaps what helps us grasp the ‘self’ as a singularity or a trans-individual when, instead of the reduced possibility of these separate and confining ‘spheres’, we are able to individuate regardless of category. Indeed, when we turn to Teshome Gabriel’s contribution to the Third Cinema debate we can glean how Third Cinema practices are such that they can often take leave of the protagonist-centric and drama-for-drama’s-sake devices of the Monoform. What informs this for Gabriel is nothing less than the heterogeneity of experiences (‘hetero-biography’ he conjectures) that come to light when differences and their various associational patterns are no longer mediated into non-existence by a kind of micro-management of the means of expression. Such a bureaucratization of culture is one in which the desire to imagine is thwarted and the creative possibilities are rendered senseless by ‘reality-testing’ and ‘believability’. What seems to be at stake in Gabriel’s writing is a kind of simultaneity between the larger lessons that a non-western cultural experience can evoke for a reassessment of not just cinema but of a mainly European-led ‘political’ discourse. This, and at the same time there is, in an echo of Solanas’s ‘thirty six varieties’, a keen attentiveness to the proliferating minutiae of experience that is often captured by Third Cinema and which could, furthermore, be said to trouble the naturalism of ‘documentary reality’ and ‘fictional reality’ by appealing to a kind of singularising vernacular and micro-social poetics that includes within it the layered temporalities and improvisational qualities of music. By stating simply that “Third Cinema includes an infinity of subjects and styles as varied as the lives of the people it portrays”, Gabriel, criticised for not taking up the ‘larger’ question of national cinemas, is pointing us away from the homogenized heroes and heroines of Western Cinema, and towards what he calls ‘unparaphraseable’ forms of life that can exist outside of such categorical distinctions as the nation state and, indeed, outside the Self as it is undynamically construed (as a non-singularity) by the European enlightenment. Key here, I feel, is the disregard of what Gabriel calls the ‘multiple points of view’ that are often a feature of Third Cinema and which, as a source of poetic juxtaposition and possible encounter, are enablers of this ‘infinity of styles and subjects’, the ’36 varieties’, that I am calling singularities. So in some ways Gabriel, in his Towards A Critical Theory of Third World Films, sets up a dichotomy between the means and techniques of Third Cinema and those of the Western Monoform. This may be seen as lacking in theoretical subtlety (a form of aesthetics?) but in so doing he depicts the way that the Monoform is constantly encouraging us to introject many aspects of bourgeois culture that come to feature as means of a more ‘refined’ colonialism; a colonialism of psychic manipulation that could best be described as an ‘endocolonialism’ (“colonial models occupying our optic nerve“ says Haile Gerima) and which, in closing the often haphazard meanders of the possible, seriously hinders the political imaginary. The Monoform does not just tell us what to feel with its manifest thematic content, but evokes in us a how-of-feeling that, in turn, defines our conceptual horizon. This use of non-actors, tellingly called ‘models’ by Robert Bresson, brings also a sense of the unpredictable in that being untrained in deliberate artful mimesis, these ‘amateurs’ bring something singular, something ‘unparaphraseable’ to the celluloid.
) that can singularise it away from a ‘perfect’ constructedness and away from the insanity of our seeking after an unattainable wholeness in places other than those that, as extra-institutional, offer the realism of social jouissance. 3 See Julio García Espinosa, For An Imperfect Cinema, in Jump Cut No.20, 1979, p.24-26. 4 Ashish Rajadhyaksha, ‘Debating The Third Cinema’ in Questions of Third Cinema, ed. Jim Pines and Paul Willemen, BFI Publishing, 1989, p.171. As the reader will discover I have found this book indispensable in orientating myself within the debates of Third Cinema. 5 See Luis Bunuel, ‘Cinema, Instrument of Poetry’ in The Shadow and its Shadow, (ed.) Paul Hammond, BFI 1978, p.68. 6 “As I see it, desire is a process of singularisation, a point of proliferation and creation of the possible within an established system […] Desire is the fact that, in a closed world, a process arises that secretes other systems of reference…”. See Felix Guattari, ‘Institutional Schizo-Analysis’ in Soft Subervisions, Semiotext(e) 1996, p.273. 7 Octavio Getino & Fernando Solanas, ‘Toward A Third Cinema’ in Tri-Continental Quarterly, 1969, p.107-132. 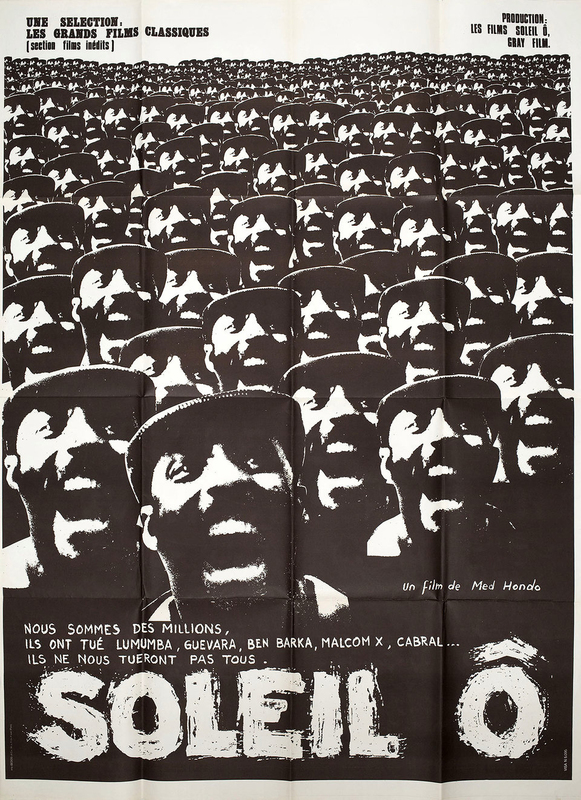 8 Clyde Taylor, ‘Black Cinema in the Post Aesthetics Era’, in Questions of Third Cinema, op. cit, p.92. Martin Bernal tracks this back to the mid 18th Century when Johann Winckelmann, seen as the founder of the discipline of Art History, offered, when discussing Egyptian art: ‘How can we find even a hint of beauty in their figures, when almost all of the originals on which they were based had the form of the African?” See Martin Bernal, Black Athena: The Afroasiatic Roots of Classical Civilisation, Vintage 1991, p.244. 9 Interview with Med Hondo in Frameworks No.7/8, 1978. 10 Octavio Getino & Fernando Solanas, ibid. 12 Paul Willemen, ‘The Third Cinema Question: Notes and Reflections’ in Questions of Third Cinema, ibid, p.4. 13 In an interview from 1979, filmmaker Safi Faye said: “For me all these words – fiction, documentary, ethnology – have no sense”. See Frameworks No.11, 1979. 14 Felix Guattari, ‘Cinema of Desire’, ibid, p.146. 15 Teshome Gabriel, ‘Third Cinema as Guardian of Popular Memory’, in Questions of Third Cinema, op cit, p. 61. 16 Peter Watkins, Edvard Munch DVD Booklet, Eureka 2007, p.62. Such ‘utopian’ imaginings of cinematic potential would be an interesting avenue to take. For now we can settle with Jean Epstein: “Like the philosopher’s stone, the cinematograph holds the power of universal transmutations. Yet, this secret is extraordinarily simple: all its magic comes from its capacity to vary temporal dimensions and orientations.” See Jean Epstein, The Intelligence of a Machine, Univocal 2017, p.88. 17 Fernando Solanas, cited by Paul Willemen, op cit, p.9. 18 The following draws upon Gabriel’s ‘Towards A Critical Theory of Third World Films’. See Questions of Third Cinema, ibid, p.30ff. 19 In this light Clyde Taylor makes an interesting observation about ‘post humanism’: “Is it humanism that is bankrupt and exhausted, or merely Euro-American humanism?” This latter he feels is a humanism based on individualism. See Clyde Taylor, op cit, p.94. There is also Med Hondo and his attempts to make the notion of character correspond to a “collective human being”. See Med Hondo, ibid. 20 For a critique of ‘Central Conflict Theory’ see Raúl Ruiz, Poetics of Cinema, Disvoir 2005. 21 Peter Watkins describes the non-professional actors he employs as not so much ‘playing a part’, but as “being a mixture of themselves and somebody else.” See Peter Watkins, ibid, p.23. 23 The reasons behind such a bewitchment are many and complex. We can be inclined to agree with Sylvia Wynter when she has it that our need for narrative is an almost innate instinct. But one wonders: what of this instinct? Is it an instinct untroubled by the vicissitudes of desire? An instinct which seeks the quickest route to satisfaction, in that, like a baby it cannot bear the frustration of its own desires? 24 Teshome Gabriel, op cit. 25 Christian Metz, Psychoanalysis and Cinema, Macmillan 1985, p.140-141. 26 See Robert Stam, ‘Beyond Third Cinema: the Aesthetics of Hybridity’ in Rethinking Third Cinema, ed. Anthony R. Guneratne & Wimal Dissayake, Routledge 2003, p.31ff.